Mr. Muhammad Salim Bilwani (Chairman). Director Finance, Gani & Tayub (Pvt) Ltd.
Mr. Abdul Razzak Kodvavi (Vice Chairman). A.R.Traders. Mr. Abdul Ghaffar Kodvavi (Treasurer). Chartered Accountant , Kodvavi & Co.
Mr. Zakaria Bilwani (Trustee). Gani & Tayub (Pvt) Ltd.
Mr. Usman Habib Bilwani (Trustee). Gani & Tayub (Pvt) Ltd.
Mr. Ebrahim Qassim (Trustee). Chief Executive, Premier Agencies / Premier Distribution. Mr. Shabbir Dewan (Trustee). Gatron, Novatex. Mr. Abdul Aziz Rehmatullah (Trustee). Director, Sikandar Private Limited. Mr. Rafique Noor Muhammad (Trustee). Export / Muscat. Dr. Zaheer Ahmad (Trustee). Chairman, Shifa International Hospital Islamabad. Shifa Foundation Islamabad.Tameer-e-Millat Foundation. Mr. Habibullah (Trustee). Vice President Admin, Tameer-e-Millat Foundation. Mr. Faqir M.Rashid (Trustee). Educationist, Tameer-e-Millat Foundation. 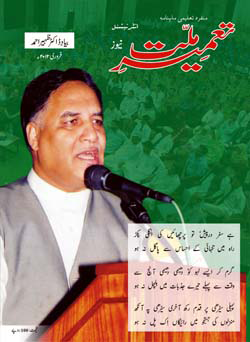 Biyad-e-Dr. Zaheer Ahmad (Special Edition on Late. Dr. Zaheer Ahmad, Founder Tameer-e-Millat Foundation).